For a smart cooker, there is one major oversight reported by consumers: even if you’re standing right in front of the appliance, you will have to launch the WeMo app on your electronic device if you want to program a specific cooking time. Ultimately, that isn’t too much of a sacrifice if your unpredictable schedule warrants the use of a Wi-Fi enabled cooker. 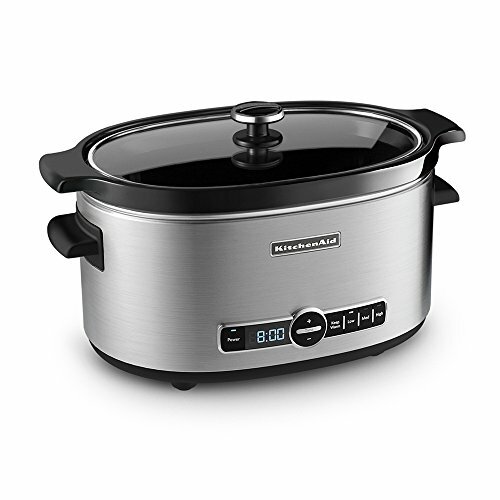 The slow cook function on this versatile multi-cooker has three temperature settings and can be programmed to operate for anywhere from thirty minutes to twenty hours. In addition to the automatic keep-warm feature, which will run for up to ten hours after your selected cook time, you can manually program the appliance to run on the keep-warm mode for ninety-nine hours and fifty minutes, which is practically unheard of. Furthermore, the appliance is a pressure cooker with yogurt making, rice cooking, steaming, porridge making and sauteing capabilities complete with an easy-to-use control panel. 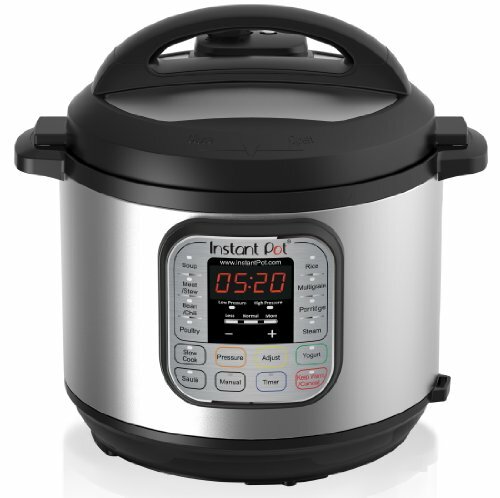 This pick from Instant Pot has fourteen different microprocessor-controlled programs and is a total game changer concerning convenience. The handles have slots to hold the lid while you’re dishing up, the digital time display is large enough to read from a distance, the steam rack has handles to easily lower and raise your food, the lid locks to prevent potential safety issues–and on and on. There’s even a twenty-four-hour timer that allows for delayed cooking if you’re preparing foods that can be safely kept at room temperature. If you’re in the market for a multi-cooker, purchasing this model may be a no-brainer. This oval-shaped slow cooker has a digital display and four temperature settings: high, medium, low and keep warm. The appliance can be programmed for up to twenty-four hours of cooking and then the keep-warm mode will automatically kick in, staying on for up to four hours. Both the ceramic vessel and glass lid can be safely cleaned in the dishwasher. KitchenAid is one of the most respected brands in the home appliance industry, which is why this model is one of the best selling slow cookers on the market. When a reliable manufacturer offers four versatile temperature settings, consumers don’t even need crazy add-on features to be happy. If you want guaranteed slow-cook success, this model passes with flying colors. 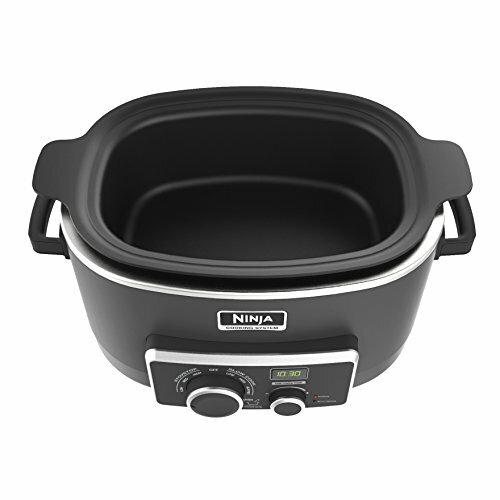 This three-in-one appliance from Ninja acts as a stovetop, oven and slow cooker, which takes one-pot cooking to new heights. The slow-cook function can be set to low, high or buffet and there’s a programmable timer to easily select a desired cook time. The keep-warm setting will automatically follow and the removable pot has a non-stick coating. While many slow cookers meet their end because of a cracked crock, this model’s cooking vessel is reportedly unbreakable. Some consumers have lodged complaints concerning how hot the appliance runs, but if you know to test out a new recipe on a day when you can keep an eye on things, then you ought to be able to identify the ideal settings for each dish you make. Even if you have a traditional stovetop and oven, having this kind of a multi-cooker around opens up some great possibilities when preparing multiple entrées and sides at the same time. Just added to the list (it's now a Top 6 list)! 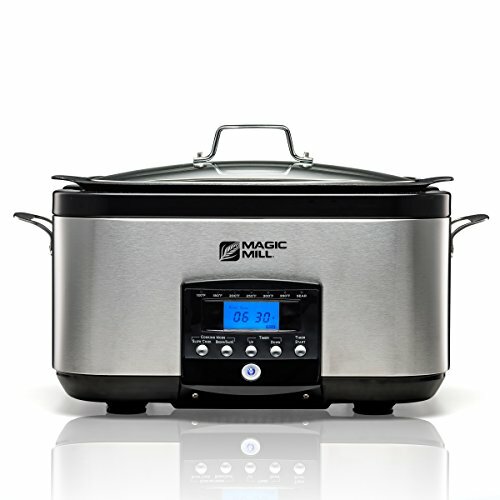 Though not well known, this Magic Mill brand slow cooker seems to be impressing people. They are posting videos and giving it five stars across the board on Amazon so far. It has the ability to not only slow cook, but to brown/sauté and sear, but you can also stir fry, steam, roast and bake all in one machine. It even comes with a steaming rack! All parts are BPA free and dishwasher safe (for easy cleanup), it it does come with an automatic warming feature when your cook time is finished. If we could only have one cooker on our countertop, we’d opt for the Instant Pot IP-DUO60 7-in-1 Multi-Functional Cooker. This six-quart appliance gives us everything we want from a slow cooker and more. Providing twenty hours of slow-cook time, nearly one hundred hours of keep-warm time and a dozen more programmable functions, there’s practically nothing this model can’t do. You want yogurt? No problem. 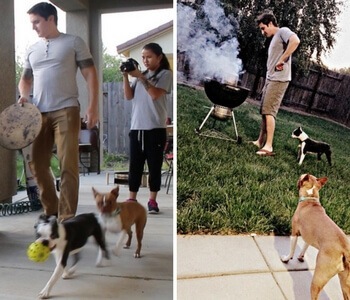 Chili? That’s simple. Steamed vegetables? Of course. With the Instant Pot, everything from meat to grains has never been easier to cook. If preparing meals is a burdensome chore for you, do yourself the favor of purchasing a deluxe slow cooker. That way, you don’t need to put in a lot of time, effort or grocery money in order to serve mouthwatering meals at home. With a great countertop appliance, you just need a good recipe, a few simple ingredients and a few hours for the slow cooker to work its magic.